Diverticulitis, a condition that occurs as the result of the development of small, bulging pouches, or diverticula, in the intestinal walls, is not uncommon. This condition is particularly common in people who are over the age of 50. When those pouches are inflamed or become infected, it can lead to severe pain in the abdomen, as well as a variety of other off-putting symptoms, including constipation, diarrhea, nausea, vomiting, bloating and a high fever. While the exact cause of diverticulitis is not known, it is believed that eating a diet low in fiber can lead to diverticulitis. Dietary fiber is important because it helps it helps to maintain the health of the bowels and promotes normal, healthy bowel movements. Fiber adds bulk to the stool, which makes it easier to pass and thereby prevents constipation. However, if you have been diagnosed with diverticulitis, your doctor may recommend eating a diet that is low in fiber. Doing so can help to ease the effects of diverticulitis, as it can help to put less strain on the intestines, thus causing less pain. If your doctor has prescribed a low fiber diet for diverticulitis, here’s a look at 15 foods you should be eating. Many people prefer to eat bread that is made out of stone ground whole wheat or whole grains over white bread. That’s because these types of bread have much more nutritional value than white bread, including fiber. 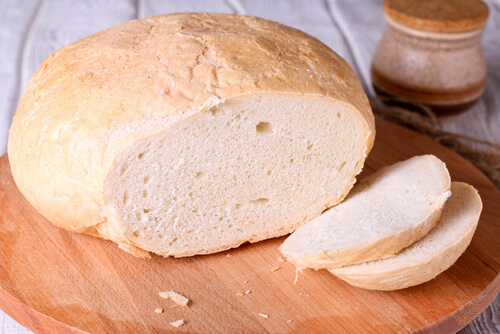 Since high amounts of fiber can aggravate diverticulitis, it’s important to steer clear of bread that is made of whole grains and instead, opt for white bread. There’s just .8 grams of fiber in a slice of white bread, making it a good choice for a low fiber diet, as it can help ease the symptoms that are associated with diverticulitis.